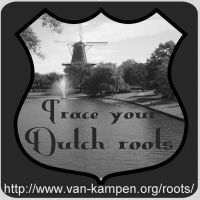 Trace your Dutch roots: Newsletter will be sent out soon! The July issue of the newsletter is almost ready for sending. Subscribers can expect a copy in their mailbox later this week. If you are not a subscriber yet, there is still time to do so. Of course we will dwell on Henry Hudson, English captain of the Dutch ship Halve Maen. Four hundred years ago he had just failed to find a route to the East Indies through the northern passage, and he was about to fail to find a passage through the Americas. He may have failed to find what he was looking for, but his discoveries did sow the seeds for the New Netherland colony and had far-reaching consequences. The newsletter will also make a tour of the twelve Dutch provinces and highlight the main online resources of each province. All this and more in the upcoming edition of the Trace your Dutch roots newsletter. Stay tuned! eric lent from lent thanks you.abraham riker/lent was my ancestor i live in florida.